So, in regards to the movie rental just for me I chose one with both qualifications in P. S. I Love You. 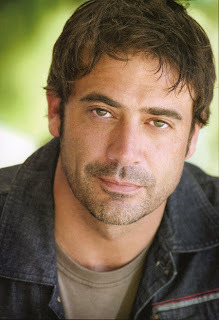 Where have you been all my life, Jeffrey Dean Morgan from Seattle? Okay, carry on with smart things. Oh...be still my heart!!! I totally fell in love/lust/whatevah with Jeffrey Dean Morgan when he was on Grey's Anatomy!! When I saw that he was in P.S. I Love you (which I read...loved...and can't wait for the DVD to come out!!!) I just knew I HAD to see it!!! He's just got that 'smokey' look about him..smoldering...okay..I'll say it...HAWT!!! I haven't seen this movie. Worth it? Or should I just click here and look at these pictures when the mood strikes? Do you ever watch Supernatural? Jeffrey Dean Morgan was on that, too, and he looked good! Mr. Morgan was my favorite on Grey's Anatomy & he has a bit part on Weeds, as the dearly departed. Oh, thank you for the candy! No need for smart things now. Jeffrey Dean Morgan reminds me of Robert Downey, Jr., only without the sordid past. I'm just noticing that both of those boys do have a slight resemblance to your sweet Stu...something about the face shape and around the eyes...what do you think?! A scruffier Scottishier Stu. JDM was is so hot and I felt incredibly behind the times when I realized I was only JUST THEN discovering him on Grey's Anatomy. He's been on Weeds a bit, but he's already dead when the show begins. Why is he always playing dead guys? WARNING WARNING WARNING Do NOT watch PS I LOVE YOU unless you are prepared to cry for DAYS. Days I tell you. I'm Irish. Do you love the Irish? I agree, this movie was not horrible, especialliy with the addition of these lovely gentlemen. I watched this movie one night when drinking some wine, when my husband went away. These movies must always be saved for girl nights.